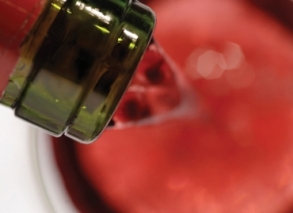 Red vs. white wine – Deciding often depends on what you’re eating. Generally, go for whites with lighter foods like fish or most pastas, and reds with heavier dishes like meat or pasta with cream or meat sauce. But ultimately, wine is a matter of personal taste, so just drink whatever tickles your fancy. Ordering from the menu - You should never order the second least expensive bottle of wine on the menu because you don’t know what to order and don’t want to look cheap. Restaurants actually prey on this psychology by pricing their cheapest (and worst) bottle of wine as the second least expensive. Getting help is okay – If you have to ask for help, go ahead. There’s no shame in that. In fact, it’s expected. Most restaurants and wine and spirits stores employ people who know what they are talking about, and love to chat. The web is also a great resource—check out sites like Dr. Vino and Wines.com to up your wine IQ. Ditch the house alcohol - Nothing ruins a drink and worsens a hangover more than house alcohol. Give specifics when ordering a mixed drink. Ketel One and tonic, not vodka-tonic. While premium may be a few more bucks, it’s worth it if you’re aim is enjoyment. If you’re aim is blackout, then by all means save money by sticking with the well options. Pick a signature drink - Making drinks at home for friends? Find a signature drink, whether it’s a mojito or a margarita. Perfect the recipe and soon friends will fawning over your bartending skills. You can also make it the drink you default to at a bar. their mystique after graduation. Now’s the time to add a little class to your alcoholic endeavors. To help you out, here’s a primer on some more refined tipples to add to your artillery, from good red wine to the finest tequila. Stay classy, graduates, at least until the next reunion. You don’t have to be that annoying d-bag from Sideways with his Merlotphobia, but knowing a thing or two about vino is a must in the competitive world of dating. Besides, it’s one of the few things that can get you tipsy and still be good for the ticker. Here are the ABCs of wine, from red to white, merlot to chardonnay. Wine classification goes by both the grape (Chardonnay, Merlot, Pinot Noir, etc…) and by region (Bordeaux, Champagne, Chianti, etc…). Each type has its own unique set of characteristics that may or may not sound appealing to you, but ultimately the trick is try a bunch of wines and figure out what you like. Many wine stores also have tasting bars, such as Vintage New York where customers can taste the wine before buying it. Go to Citysearch and enter “free wine tastings” to see what each specific city has to offer. Also, check out these sites for more local wine events and help finding a winery. Cabernet Sauvignon- Generally full-flavored with a smooth and lingering finish. Shiraz (or Syrah in France) – Tastes full-bodied with flavor notes of anything from violets to berries, chocolate, espresso, and black pepper. Merlot – Has a medium body with hints of berry, plum, and currant, and a buttery finish. Chardonnay – As one of the most versatile wines, often oaky but it can also be soft with fruity flavors or smoky with flavors of vanilla, caramel, or butter. Sauvignon Blanc – Tastes crisp, dry, and refreshing with flavors ranging from grass to tropical fruit. Pinot Grigio – Good for beginners due to its sweet, light, crisp, and neutral flavors. Like a great meal, wine reveals its subtleties when served correctly. Indeed, in the world of wine, glassware is just as important as knowing how to get red wine out of white linen pants. Here is a guide to choosing the right glass. In order to be the wine connoisseur of the posse, you need to know some basic (and not so basic) wine terms. Luckily, wines.com provides an online wine encyclopedia so if you ever get stuck debating the pros of oak-aging versus barrel-aging, you can fake a trip to the restroom and detour to your handy online guide. Order a Vodka Tonic at most bars and we’ll probably get a tall glass of ice with three-parts flat tonic water and one part engine coolant, also known as bottom shelf vodka. It might get us messed up, but it is sure to leave us with a very un-classy hangover the next morning. Ordering and mixing cocktails depends on the recipe and the ingredients, so check out the quick list below to stay classy and clear—until the third Belvedere Martini that is. Mixers: As one of the most versatile alcohols, it can be mixed with everything from tonic to tomato juice. Whatever strikes our fancy. Mixers: Coke, ginger ale, club soda, or none at all. Mixers: Rarely mixed, but as we all know, often taken in shot form with lime and salt (ouch, bad hangover memories). Apparently, it's ok to be a lightweight. In NYC, doggy bags aren't limited to just your leftover chicken parm. According to the (fairly) new "cork and carry" state law, if you are unable to finish a bottle of wine that you've purchased with a full meal at a restaurant, you can have it packed up alongside your leftovers. The restaurant simply has to securely reseal the bottle and place it in a one-time-use, tamper-proof transparent bag. And you're good to go. It's a great alternative to taking down those last few glasses of merlot irish car bomb style. I went to a Japanese restaurant the other night (Itzakaya 10 on 10th ave in manhattan) where they will keep your unfinished bottle of sake behind the bar for up to 3 months, so you can order to your heart's content without worrying about waste. Delicious. Sake is delicious.